IBPS Clerk Notification 2019: The Institute of Banking Personnel Selection (IBPS) conducts the IBPS Clerk CWE (Common Written Exam) every year to select candidates for the clerical cadre in multiple public sector banks across the country. IBPS Clerk Recruitment Notification 2019 (CWE-VIII) will be released on the IBPS official website: ibps.in to recruit eligible candidates for the post of IBPS Clerk. This year, IBPS Clerk Notification is expected to announce around 8000 vacancies. IBPS Clerk 2019 Prelims exam is set to be held on 7th, 8th, 14th, and 15th December 2019 and the Main exam on 19th January 2020. IBPS Clerk Recruitment will be made on merit based on the cumulative scores of both the preliminary exam and the mains exam. No interview process is involved in the recruitment process. For more information regarding IBPS Clerk Notification 2019, check out the article below. Candidates must meet all the IBPS Clerk Eligibility Criteria listed below. It is, therefore, very important that you check the eligibility criteria before applying for the exam. 5. a person of Indian origin who has migrated from Pakistan, Burma, Sri Lanka, East African countries of Kenya, Uganda, the United Republic of Tanzania (formerly Tanganyika and Zanzibar), Zambia, Malawi, Zaire, Ethiopia and Vietnam with the intention of permanently settling in India, provided that a candidate belonging to categories (ii), (iii), (iv) & (v) above shall be a person in whose favour a certificate of eligibility has been issued by the Government of India. Educational Qualification: Candidates must be a graduate in any discipline (or have an equivalent degree) from a recognized University. Computer Literacy: Candidates must be proficient with using computers and have a Certificate / Diploma / Degree in Computer Operations / Language or have studied Computer as one of the subjects in High School or College. Language Requirement: Candidates must be able to read, write and speak in the official language of the State / Union Territory they apply for. IBPS Clerk application form will be made available on the official website of IBPS by the month of September 2019. Candidates can apply for the exam only in the online mode. Recent passport sized color photograph (4.5 cm X 3.5 cm) of the candidate in JPEG format; the size should be 20 to 50 kb whereas the dimension should be 200 x 230 pixels. Signature, Left Thumb Impression and Hand-Written Declaration should in JPEG format of size between 10 to 20 kb. Step 1: Logon to the official website of IBPS – ibps.in. Step 2: Click on the link provided to apply for “CRP Clerks-VIII”. Step 3: Click on “Click Here to Apply Online”. Step 4: Click on “Click Here for New Registration”. Step 5: Enter your basic information, like Name, Date of Birth, Email ID and Mobile Number to register yourself. Step 6: A Provisional Registration Number and Password will be generated after you have submitted your basic information. Note them down. Step 7: The same will also be sent to you via your registered email ID and phone number. Step 8: Login with your Provisional Registration Number and Password, and edit the particulars if necessary. Step 9: Enter your Personal, Academic and other details. Step 10: Upload scanned copies of your Signature, Photograph, Left Thumb Impression, and the hand-written declaration. Step 11: Make payment of IBPS Clerk 2019 application form fees. Step 12: Click on “Submit”. Step 13: Take a printout of your IBPS Clerk Online application form 2019 for future reference. The fees can be paid only in the online mode through Credit /Debit cards and Net Banking. IBPS Clerk exam is conducted in two phases, namely, Preliminary and Main. The prelims are conducted only to shortlist candidates for the Mains exam. Final selection is based on a candidate’s performance in the Mains examination. The IBPS Clerk exam pattern for the Preliminary examination has undergone a minor change from last year – the different sections of the IBPS Clerk Prelims exam will be separately timed from this year which was not the case before. The pattern of the Main exam remains the same as before. The duration for the IBPS Clerk prelims exam is 1 hour wherein each section is assigned 20 minutes. Candidates must clear the cut off for each section as well as the overall cutoff in order to appear for the Main exam. Each of these sections has been separately timed, which means there is separate time allotted for each section and candidates must finish off each of these sections within the allotted time. The total time duration is 160 mins. Note that there is negative marking 0.25 marks allotted to a question for wrong answer in both Prelims and Mains. Except the test of English Language, all the sections will be available in English and Hindi. IBPS Clerk Admit card/ call letter/ hall ticket will be released separately for Prelims and Mains. Candidates will have to log in with their Registration Number/Roll Number and Password/Date of Birth generated at the time of registration to download the IBPS Clerk admit card. It is to be noted that the IBPS Clerk Admit Card will not be sent individually to anyone and candidate must visit the official website in order to download the IBPS Clerk Admit Card. Generally, the IBPS Clerk Admit Card for Prelims as well as for Mains will be released 10 to 15 days prior to the examination. Each of the stages has two different types of cutoff marks – sectional IBPS Clerk cutoff and overall IBPS clerk cutoff. The final merit after result declaration will be based on the marks secured by the candidate in the IBPS Clerk Mains exam. Having said that, the preliminary stage is also significant because that is where the initial screening takes place. IBPS Clerk Notification 2019 : Which banks comes under IBPS? The initial Basic Pay for IBPS Clerk is Rs 11,765. The IBPS Clerk pay scale is: 11765-655/3-13730-815/3-16175-980/4-20095-1145/7-28110-2120/1-30230/1310-1-31540. Q: What is the salary of an IBPS Clerk? A: As per the expected IBPS Clerk notification, the basic salary of an IBPS Clerk is Rs. 11765/- with the gross salary being Rs. 19472.22/- or Rs. 19589.87/- depending on the HRA which depends on location. Q: What is the exact job profile of an IBPS Clerk? a) They are responsible for deposit and withdrawal of cash by the customers. Along with that clerk also undertakes the receipt of cheques, drafts, dividend warrants, and pay orders. b) They deliver checkbooks subject to authorization by competent Authorities. c) They issue cash receipt and ESI Stamps. However, with the digitization age, these days the job profile is mostly related to working on a computer and entering the day to day transactions and other necessary information served to the customers. Please refer to the IBPS Clerk Recruitment notification PDF for details. Q: Is there any negative marking this year? A: In both prelims and mains as per IBPS Clerk Notification 2019, for every wrong answer, a candidate will lose one-fourth or 25 percent of the mark assigned to that question. However, there is no negative marking for questions not attempted. Q: Is there any percentage criteria in IBPS Clerk Notification 2019? A: There is no percentage criteria defined as per by IBPS Clerk Notification. A candidate needs to be just graduate to be eligible to apply for the IBPS Clerk Recruitment 2019. Q: How many attempts are there for IBPS Clerk Exam? A: A candidate can give the IBPS Clerk exam as many times as required. Now that you know everything about IBPS Clerk Notification exam 2019, you shouldn’t waste a day. If you are a serious banking aspirant, you should start your IBPS Clerk preparation right away. Go through the IBPS Clerk syllabus for each stage and section and start with understanding the underlying theory behind the concepts. Develop reading habits as well. Practice as many IBPS Clerk practice questions as possible and master each and every topic. Then take IBPS Clerk mock tests once the entire syllabus is over. Analyze how you have performed and then improve on your weak areas. 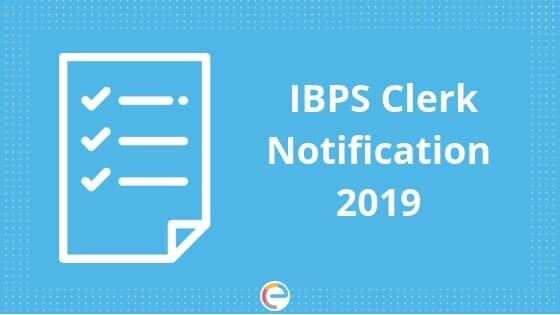 We hope this detailed article on IBPS Clerk Notification 2019 helps you. If you have any query regarding IBPS Clerk Notification, feel free to ping us. You can also drop a comment below. We will definitely get back to you. Even if you had Computer as one of the subjects in your school / college, it will be enough.